The Repertory Theatre of St. Louis takes a different step this holiday season and presents what is basically a children’s classic for the stage- “The Adventures of Tom Sawyer.” This new adaptation by Laura Eason manages to capture the spirit of the great Mark Twain characters and keeps a children-loaded audience riveted through two acts. It’s a marvel to watch and an even bigger treat to hear the silence as the kids in the audience are enjoying the on-stage shenanigans as much as their folks. Leading the way as the title character is Tim McKiernan. He manages to provide the wonder and amazement that’s around every corner for a young boy. 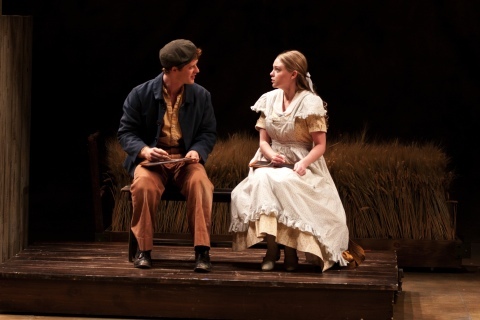 Joining him in the fun is Robbie Tann as Huckleberry Finn and Hayley Treider as Becky Thatcher. Although all post college age, they manage to embrace the exuberance of youth. The rest of the cast shines as well as they all play major roles and bring other members of the ensemble to life as well. Michael D. Nichols is an imposing Injun’ Joe while Joseph Adams plays the wrongly accused Muff Potter and Nance Williamson is a stern Aunt Polly. Justin Fuller and Nate Trinrud round out the cast. Director Jeremy B. Cohen brings the vivid characters to life and, as I mentioned before, manages to hold the rapt attention of young and old alike. Special notes go out to the technical staff including the Daniel Ostling set design which makes for colorful movement to portray the multiple locations including a highly effective sequence in the cave. And the powerful lighting design of Robert M. Wierzel brings those moments in the cave to life and dazzles us with some tricks for the eye during the whitewashing of Aunt Polly’s fence. Although we miss the usual musical during this holiday slot, we’ll get our fill next month with Sondheim’s “Sunday In The Park With George.” All in all, you can’t ask for a better holiday show to share with the family than “The Adventures of Tom Sawyer.” You can enjoy it through December 23rd on the Mainstage. Call 314-968-4925 or log onto http://www.repstl.org for tickets or more information. This entry was posted on December 5, 2011 at 9:43 am12 and is filed under Uncategorized. You can follow any responses to this entry through the RSS 2.0 feed. You can leave a response, or trackback from your own site. 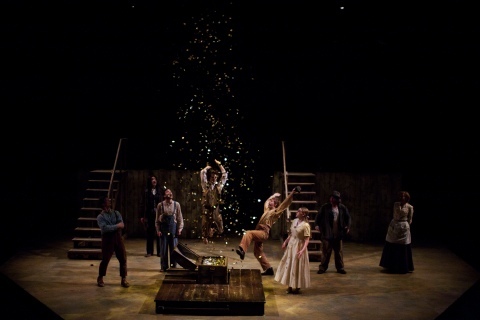 post your weblog: https://stagedoorstl.com/2011/12/05/tom-sawyer-a-major-treat-for-young-and-old-alike/ to my on-line directory. I used, “�Tom Sawyer� A Major Treat for Young and Old Alike | Stage Door St. Louis” as your web site headline. I hope this is alright with you. In the event you’d like me to change the title or perhaps remove it completely, e-mail me at veronicaelliot@live.de. Thanks for your time.